Norman Ulysses Edwards (Sr.) is the son of Alpheus Edwards and Lea Schreiner. He was born 14 September 1833 in Lancaster, Fairfield, Ohio and died 14 September 1905 -- on his 72nd birthday -- in Sabetha, Brown, Kansas. He was buried 17 September 1905 in Hill City, Graham, Kansas. 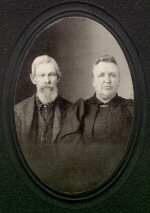 On 10 April 1856, he married (1) Elizabeth Melissa Hastings in Union, Hancock, Ohio. She is the daughter of Seymour Hastings. Melissa, as she was known, was born 15 April 1839 in Union, Hancock, Ohio and died 15 August 1861 at age 22 in Hancock County, Ohio. On 26 March 1865, he married (2) Sophie Bish in Hancock County, Ohio. On 16 August 1866, he married (3) Luzetta Blodgett in Hancock County, Ohio. She is the daughter of Darrow Blodget and Melinda Sneer. She was born 6 June 1843 in Blanchard, Hancock, Ohio. She died 9 January 1917 at age 73 in Penokee, Graham, Kansas. She is buried at Rock Creek Cemetery, Hill City, Graham, Kansas. Reuben Alpheus Edwards was born about 1 December 1858 in Union, Hancock, Ohio. William Joseph Edwards was born 2 November 1859 in Blanchard, Hancock, Ohio. Lucinda Lemond Edwards was born about 22 June 1867 in Findlay, Hancock, Ohio. She died 8 September 1868 at just over one year old in Findlay, Hancock, Ohio. Norman Ulysses Edwards (Jr.) was born 21 November 1868 in Findlay, Hancock, Ohio. He died 2 May 1871 at two in Findlay, Hancock, Ohio. Leah Livenia Edwards was born 16 July 1870 in Findlay, Hancock, Ohio. Mary Malinda Edwards was born 16 May 1872 in Sabetha, Brown, Kansas. Harvey Leonard Edwards (Sr.) was born 12 May 1874 in Sabetha, Brown, Kansas. Norman entered military service in November 1861 as a private in K Co. 65th Inf Reg, Ohio. He was mustered in Nashville, TN 14 Dec 1864. Norman: Marriages from Marriages of Hancock County Ohio. Norman (presumed): 1840 census. Blanchard, Hancock, Ohio. Page 9. Elizabeth (presumed): 1840 census. Blanchard, Hancock, Ohio. Page 8. Norman: 1850 census. Blanchard, Hancock, Ohio. Page 809. Elizabeth: 1850 census. Union, Hancock, Ohio. Page 967. Luzetta: 1850 census. Blanchard, Hancock, Ohio. Page 807. 1860 census. Union, Hancock, Ohio. Page 45. Luzetta: 1860 census. Union, Hancock, Ohio. Page 48. 1880 census. Gettysburg, Graham, Kansas. Page 9. 1910 census. Hill City, Graham, Kansas. Page 1.